Everything you need to know about the Euroleague rooms. Four qualifiers that will decide who disputes the Final Four of Vitoria (May 17-19). 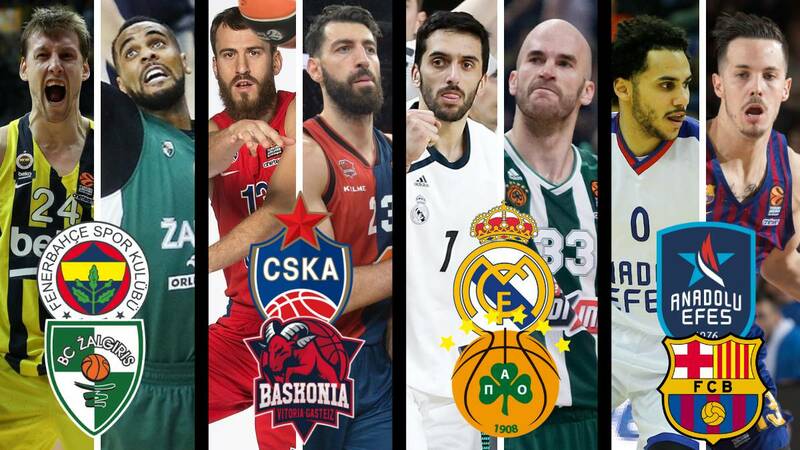 La Final Four of the Euroleague 2019, which will be played in Vitoria on May 17 and 19, could be historic as three Spanish teams fight to be in the final series. Real Madrid, 3rd place after the regular phase , will once again measure Panathinaikos (6º) , although this year it has the advantage of a field. The Barcelona Lassa (5th) must win the revelation of the course (Anadolu Efes, 4th classified), if he wants to be in Vitoria and the Kirolbet Baskonia (7th), ganar in Moscow to CSKA - something he has not achieved since 2002- to fulfill the I dream of being in his Final Four. In the other quarterfinal match one of the games of the Final Four in Belgrade is reissued: Fenerbahçe (1st) against Zalgiris (8th) . CSKA Moscow is used to playing the Final Four. Since the modern Euroleague was established (2001-02) it has been in 16 of the 18 possible. A team with a lot of talent and budget, but that has only won three titles since then (2006, 2008 and 2016). The Baskonia began the course with one goal: to be in its Final Four (it is disputed in Vitoria), but for that it will have to break its bad streak in Moscow. He has not won CSKA there since April 2002. The Vitoria team has just recovered Shengelia. Character Baskonia against history. Real Madrid and Panathinaikos come back to cross with a place for the Euroleague in play. It happened last season with triumph for the whites, even though the advantage of track had the Greeks. Panathinaikos, with change of bench in the middle of season (Pitino arrived and Xavi Pascual left) is one of the most fit teams in Europe at the moment and deals with the possible MPV of the season: Nick Calathes. The Real Madrid does not arrive in a fine moment to this decisive phase and above can not count on Sergio Llull. The Menorcan base suffered a fibrillar fracture and, except for surprise, it would not reach the first four matches in time. In Istanbul there has been an authentic revolution. El Anadolu Efes closed last season as the worst team in the entire Euroleague, but in this one it has settled among the first four classified. Barcelona is also living a better moment than in past seasons: it is the first time they have crossed the quarter-finals since the Euroleague changed format (2016-17). The Efes will feature shooters (Larkin, Simon, Beaubois ...) and will challenge Barcelona with a former teammate. Moerman left the Barça team this summer and is signing a great year in Istanbul. Next to him, the German tower Tibor Pleiss. The Barcelona is entrusted to the talents of Tomic, the explosiveness of Hanga and the good direction of Thomas Heurtel. The four participants in the Final Four of the Euroleague 2019 will be decided as in recent years (since the 2008-09 season). The series will be the best of five matches (the teams that have three victories pass first). The first, second and fifth match (if necessary) will be played on the court of the team that finished with the advantage of the court (the first four classified) and the third and fourth match on the court of the other team. 1th match: April 16th at 7:00 p.m. 2nd game: April 18th at 7:00 p.m. 3rd game: April 24 at 6:00 p.m. 20: 30h 4th match: April 26 at 8:30 p.m. 5th game: May 1 at 7:00 p.m. The base of Panathainikos lands in the playoff after becoming the first player to sign a triple-double in the Euroleague in 13 years. Calathes is one of the main candidates to become MVP this season. Part of the options of Panathinaikos are in the hands of the best passer in the Euroleague (8,9 on average this course) . One of the clear dominators of the European indoor game. The Czech center of Fenerbahçe has finished as the third most valued of the entire competition (19.3 credits) and is an insurance in Obradovic's plans. Great connection with Kostas Sloukas, another of the players to keep in mind in these playoffs. The arsenal of CSKA is very big, but Cory Higgins has taken a step forward this year. Second top scorer in the entire Euroleague (14.9 points) and also one of the best shooters in the competition: 90/179 in triples (50.3% effective). He is the son of Bobcats operations president, Rod Higgins, and godson of Michael Jordan. The Argentine base will have a difficult role in these playoffs. With Sergio Llull injured (Melwin Pantzar is the other team's baseman), he will be many minutes on the track and will also have to stop Nick Calathes, the star of Panathinaikos. Unbalancing in the one on one, I understand the game as anyone. It has just come out of an injury and we will have to see how it is, but if someone represents the Character Baskonia is him. The Georgian power forward planted the NBA in 2017 to stay in Vitoria. If he had not been injured, he would enter the pool of potential MVP of the season. Adam Hanga is multipurpose, Pau Ribas returns to a great level and Ante Tomic dominates the painting, but the options of Barcelona are in your hands. Heurtel is a reference in attack (top scorer of his team with 10.5 average points) and also a great passer: 5 assists per game. The Zalgiris is in these playoffs, thanks in part to him . The pivot dominated the painting at the Palace (27 points and 10 rebounds) and Zalgiris won Madrid at home on the last day. Fourth highest scorer of the Euroleague (14.4 points) . Last season was at Barcelona, but did not enter Pesic's plans and ended up at Efes. A classic power forward, with very good shot of three and that this course has been the highest scorer (12.3 points) and rebounder (6.4) of one of the big surprises of the season.